These make great gifts for the holidays. They are addictive. They can be made ahead and stored for 1 month in the fridge. Beat 2 egg whites until stiff. 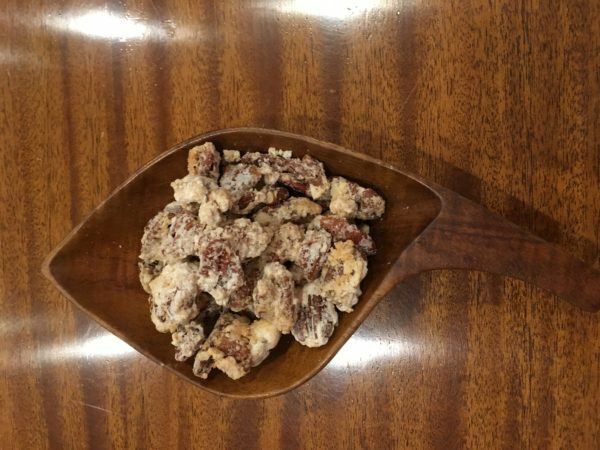 Add dash salt and 1-cup sugar and fold in 1-pound pecan halves. Melt 4 TBS butter and pour onto cookie sheet. Pour pecan halves onto cookie sheet and bake in a 300-degree oven for 30 minutes. Turn with spatula every 10 minutes. Note: 2 batches fits on 1 cookie sheet.